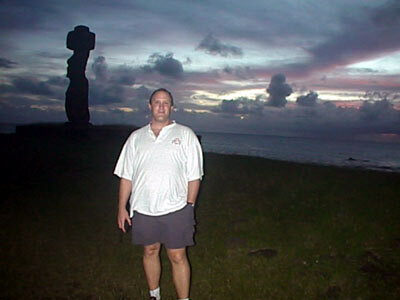 One of our main reasons for us choosing to tour the South Pacific islands was that we'd be able to visit Easter Island. The island did not let us down. We enjoyed Easter Island not only for its mysterious statues but also for its stunning natural beauty. A complete rainbow nearly every day was also very special. In addition, we enjoyed meeting and talking with the other travelers who had chosen to come here. Easter Island was in many ways unique and we liked that. We were really happy to find out that getting to Easter Island was much easier than it orginally looked. LanChile is the only airline that flies to Easter Island. Tara checked their web site and found out that there were two flights a week from Papeete to Easter Island. We really hoped we'd be able to buy our tickets in Papeete as the Lonely Planet book stated. Lonely Planet was correct! All it took was about one hours worth of hunting down the LanChile office and 86,860 Pacific Franc. After three days of waiting for the next flight in Papeete, we boarded a 1:30am flight headed to Easter Island! Our first views of the island showed that it was a a green, rocky island. Our first impression was that it reminded us of Scotland. We were excited to be landing on an alternate, emergency Space Shuttle runway. If the shuttle ever does have to land at Easter Island, we can now say "been there!". Arranging a guesthouse was also easy according to the Lonely Planet. Again, they were right because alongside of the luggage collection belt, there were numerous windows staffed with people who wanted you to stay at their guesthouse. Seth liked Luis and his Puku Rangi Uka guesthouse. We commited to one night and drove off with him in his van to his house. The room was basic, but clean enough. It had big sliding glass doors that overlooked a very nice garden. We had planned on going to sleep immediately, but he offered to take us to the bank to get out money, so we went back into town after dropping off our packs. At the bank, we discovered that Luis seemed like a bit of a schemer. He helped us by-pass the numbered queuing system and go straight to the front of the line. He also helped us by-pass a second numbered queuing system. Keep the tourists happy I suppose! After we were stocked up on money and a few groceries, we did head home for our nap. Those middle-of-the-night flights are rough. We awoke just before sunset and headed into town for our first glimpse of a stone statue. Upon arriving and seeing our first maoi status, we felt like we'd accomplished our South Pacific goal. We also reached the original amount that we'd budgeted for our trip while here, so in some ways, we started feeling like this South Pacific phase of our trip was over. We started talking more and more about ending our trip.